Slipped Disc | Hello, Lang Lang. Is this what you’re here to promote? 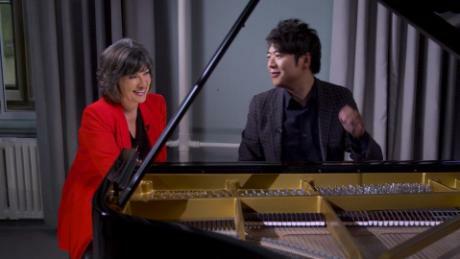 Hello, Lang Lang. Is this what you’re here to promote? Christiane Amanpour’s interview technique has gone way downhill since her war correspondent days. Amanpour was utter crap as a war correspondent too. This is a nice idea, Lang Lang. A sort of musical autobiography. The late American pianist, Morton Estrin (with whom I studied before Adele Marcus), did a fabulous series in the 1970s for Connoisseur Society records, which many people today might otherwise not be aware of, titled, ‘Great Hits You Played When You Were Young’. If you’re lucky, there might be some copies left on LP, and possibly if they transferred to CD. Cut her some slack: She’s certainly not interviewing an Einstein here. And only an abused child could so torture Fur Elise! Keen observation about Amanpour. She is now a promoter and cannot be taken seriously. She doesn’t probe; rather, she enables by mocking her true mission. Her recent celebrity interview with P Domingo is a case in point. It’s always so much better if interviewers know the subject. Zsolt Bognár is a case in point. Yeah, Amanpour IS a piece of…..work, alright! !